Grace Thorsett passed away January 30, 2019 at the age of 90. A funeral service will be held on Monday, February 4, 2019 at 11:00 AM, with visitation one hour prior, at Ballard-Sunder Funeral & Cremation (4565 Pleasant St. SE) in Prior Lake. Rev. Dr. Brent Parrish will preside, and Grace’s grandchildren will act as pallbearers. Grace will be laid to rest at Fort Snelling National Cemetery in Minneapolis. As a teenager, Grace met the love of her life, navy man Donald Thorsett, through a mutual friend. Grace knew immediately that Don was the one for her. They married on July 16, 1946 at St. Paul’s Lutheran Church in Minneapolis. They were blessed with seven wonderful children, Ron, Cherilynn, Gloria, Patricia, Randall, Karen & Kristen. Grace was a dedicated homemaker. 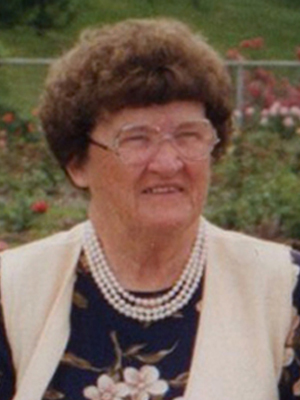 She loved baking and was an avid quilter and seamstress. Grace sewed her children’s clothing while they were growing up. Later grandkids arrived, she presented them with individual quilts, PJs and stuffed animals. In addition to her busy home life, she volunteered in the school cafeteria where her kids attended school, and assisted at the VFW. Don and Grace were lifelong nomads. Don’s work allowed them to live in Boston, Philadelphia, South Dakota, Minnesota & Sweden. They especially loved their time in Sweden, as they were both very proud of their Scandinavian heritage. She also enjoyed all the motorhome trips she and Don took, including to all 50 states, and visits to extended family all over the country. They made frequent trips to Branson, Missouri for their favorite country and western music. Cats were a passion with Grace, and a recurrent theme. She and Don parented brother and sister cats for much of their later years together, and they featured prominently in Grace’s crafts, clothing, personal effects, and of course, family greeting cards. Grace was a baseball fan, and enjoyed going to Minnesota Twins games and watching on TV. The past 15 years, Grace has lived in Prior Lake. She lived at Creekside Commons and made many wonderful friends there. Don passed away in 2012, after 65 years of marriage. Grace is now reunited with her beloved husband. Grace’s family would like to thank all of her friends at Creekside Commons for everything they did for her over the years. Grace was a creative and talented woman. She was always so proud of her family, and they will now carry on her legacy. Grace will be remembered always by her children, Ron (Jody) Thorsett, Cherilynn (Jim) Kzaley, Gloria (Bill) Jiorle, Patricia (Terry) Crouse, Randall Thorsett, Karen (Jerre) Thorsett-Hill and Kristen (Bob) Kowalski; grandchildren, Tom, Jenna, Dan, Steve, Kevin, Jenni, Lisa, Joe, Brian, Melissa and Brandon; 13 great-grandchildren; other loving relatives & friends. Grace was greeted in Heaven by her husband, Donald Thorsett; parents, Oscar & Minnie Anderson; siblings, Clarice, Kathryn, Lois, Audrey, Orel and Ward. With a heavy heart, please except my deep condolences on the death of your Mom. You were her angels, now she is yours. I am so sorry to hear of your mom’s passing today. My thoughts and love are with you all during these very sad days. I only met your Mother once but spoke with her many times. Both she and Don will always be remembered for two wonderful people; Don at the wheel, cowboy boots on, and Grace manning the map on motorhome voyages. Both Don & Grace were very proud of each and every one of their children and spoke of them often. Each of you should be proud of your parents. Goodspeed to Grace and now she’s with her beloved Don. Thank You Charlie for those kind words.